A new collection of Brahms and Mozart recordings by the Stuyvesant Quartet from 1947 conveys a kind of inward grace. A movie last year called A Late Quartet told the traumatic story of what happens when a famous string quartet has to change personnel. But, in fact, most string quartets — like symphony orchestras, only more conspicuously — continually change players, because players retire, or die, or get more lucrative offers. That was certainly the case with the Stuyvesant Quartet, the New York group that paved the way for such distinguished American chamber groups as the Hollywood, the Yale and the Juilliard Quartets. From the beginning, there were the two Shulman brothers, cellist and composer Alan and violinist Sylvan, professional classical and jazz musicians who played in a number of earlier chamber groups and orchestras, including Arturo Toscanini's legendary NBC Symphony. For seven years, they kept changing partners until the quartet finally stabilized in 1945, even forming its own record label, Philharmonia Records. Despite enthusiastic reviews, the individual players could earn a better living in orchestras or conducting, and they disbanded in 1954. Bridge Records has been releasing some of their recordings on a new album, and I'm sorry to admit that I haven't paid much attention. But I found the contents of the latest release irresistible, and I now have another group to add to my pantheon. This new disc includes three of the most beautiful works in the chamber-music repertory, and the performances are outstanding. First comes the Brahms Clarinet Quintet, one of the composer's late and most autumnal pieces. Looking at the familiar photographs of the gray-bearded composer, we forget that Brahms was only 57 when he decided to stop composing. But he became re-inspired by the clarinetist Richard Mühlfeld to write four chamber pieces featuring the clarinet, the most ambitious of which is the Quintet. The Stuyvesant plays it with unforced tenderness and warmth, and in the American clarinetist Alfred Gallodoro, who was also a member of Toscanini's orchestra, the string players have an ideal partner. This new Stuyvesant Quartet album is completed by two late Mozart quartets. The so-called Hoffmeister, named after one of Mozart's patrons, is one of Mozart's most assured and ravishing works, whose formal mastery is part of its extraordinary eloquence. The other Mozart quartet on the Stuyvesant album, also in the optimistic key of D, is one of the so-called "Prussian" quartets, which Mozart intended for the king of Prussia, Friedrich Wilhelm II, who was a skillful cellist. Alan Shulman excels in the cello part, but all the players excel in every part. In too many performances of these wonderful works, virtuosos emphasize their own virtuosity — the richness of their sound and the brilliance of their technique — over their sensitivity to the nuances of the music. The Brahms quintet can get thick and whipped-creamy. Mozart quartets can range from prissy and mechanical to overstated and forced. But these recordings by the Stuyvesant Quartet convey natural refinement, balance and a kind of inward grace. They take their place among the most luminous chamber-music performances on record. In 1938, the Stuyvesant Quartet became one of the first string quartets to be made up entirely of American players. But the Stuyvesant, which stopped playing in 1954, has been largely forgotten. The new release of a historic Stuyvesant Quartet CD makes classical music critic Lloyd Schwartz hope for a revival of interest in this ensemble. LLOYD SCHWARTZ, BYLINE: A movie last year called "A Late Quartet" told the traumatic story of what happens when a famous string quartet has to change personnel. But, in fact, most string quartets - like symphony orchestras, only more conspicuously - continually change players, because players retire, or die, or get more lucrative offers. That was certainly the case with the Stuyvesant Quartet, the New York group that paved the way for such distinguished American chamber groups as the Hollywood, the Yale and the Juilliard Quartets. From the beginning, there were the two Shulman brothers, cellist and composer Alan and violinist Sylvan, professional classical and jazz musicians who played in a number of earlier chamber groups and orchestras, including Arturo Tuscanini's legendary NBC Symphony. 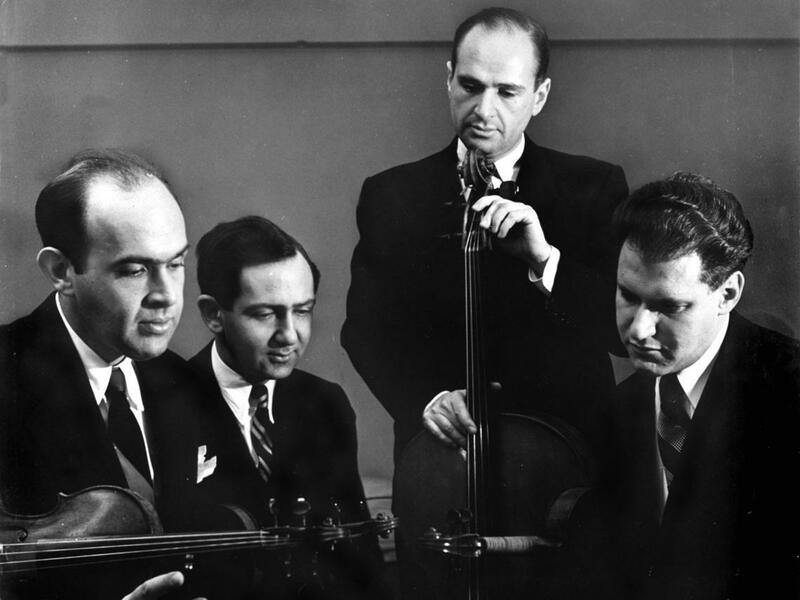 For seven years, they kept changing partners until the quartet finally stabilized in 1945, even forming its own record label, Philharmonia Records. Despite enthusiastic reviews, the individual players could earn a better living in orchestras or conducting, and they disbanded in 1954. Bridge Records has been releasing some of their recordings on CD, and I'm sorry to admit that I haven't paid much attention, but I found the contents of the latest release irresistible, and I now have another group to add to my pantheon. This new disc includes three of the most beautiful works in the chamber music repertory and the performances are outstanding. First comes the Brahms Clarinet Quintet, one of the composer's late and most autumnal pieces. SCHWARTZ: Looking at the familiar photographs of the gray-bearded composer, we forget that Brahms was only 57 when he decided to stop composing. But he became re-inspired by the clarinetist Richard Muhlfeld to compose four chamber pieces featuring the clarinet - the most ambitious of which is the quintet. The Stuyvesant plays it with unforced tenderness and warmth and in the American clarinetist Alfred Gallodoro, who was also a member of Toscanini's orchestra, the string players have an ideal partner. This new Stuyvesant Quartet CD is completed by two late Mozart quartets. The so-called Hoffmeister, named after one of Mozart's patrons, is one of Mozart's most assured and ravishing works, whose formal mastery is part of its extraordinary eloquence. SCHWARTZ: The other Mozart quartet on the Stuyvesant CD, also in the optimistic key of D, is one of the so-called Prussian quartets, which Mozart intended for the King of Prussia, Frederick Wilhelm the II, who was a skilful cellist. Alan Shulman excels in the cello part, but all the players excel in every part. SCHWARTZ: In too many performances of these wonderful works, virtuosos emphasize their own virtuosity - the richness of their sound and the brilliance of their technique - over their sensitivity to the nuances of the music. The Brahms quintet can get thick and whipped-creamy. Mozart quartets can range from prissy and mechanical to overstated and forced. But these recordings by the Stuyvesant Quartet convey natural refinement and balance, a kind of inward grace. They take their place among the most luminous chamber music performances on record. GROSS: Lloyd Schwartz teaches creative writing in the MFA program at the University of Massachusetts, Boston. He reviewed a new disc by the Stuyvesant Quartet on Bridge Records. Transcript provided by NPR, Copyright NPR.